As I thought, the sermon series on the Exodus was leading up to the Passover. The reading was from Exodus 11:1 – 12:15. A long reading you can find for yourselves here: I am quoting part of it. The Lord said to Moses and Aaron in the land of Egypt, “This month shall be for you the beginning of months. It shall be the first month of the year for you. Tell all the congregation of Israel that on the tenth day of this month every man shall take a lamb according to their fathers’ houses, a lamb for a household. And if the household is too small for a lamb, then he and his nearest neighbour shall take according to the number of persons; according to what each can eat you shall make your count for the lamb. Your lamb shall be without blemish, a male a year old. You may take it from the sheep or from the goats, and you shall keep it until the fourteenth day of this month, when the whole assembly of the congregation of Israel shall kill their lambs at twilight. “Then they shall take some of the blood and put it on the two doorposts and the lintel of the houses in which they eat it. They shall eat the flesh that night, roasted on the fire; with unleavened bread and bitter herbs they shall eat it. Do not eat any of it raw or boiled in water, but roasted, its head with its legs and its inner parts. And you shall let none of it remain until the morning; anything that remains until the morning you shall burn. In this manner you shall eat it: with your belt fastened, your sandals on your feet, and your staff in your hand. And you shall eat it in haste. It is the Lord’s Passover. For I will pass through the land of Egypt that night, and I will strike all the firstborn in the land of Egypt, both man and beast; and on all the gods of Egypt I will execute judgements: I am the Lord. The blood shall be a sign for you, on the houses where you are. And when I see the blood, I will pass over you, and no plague will befall you to destroy you, when I strike the land of Egypt. It has been said that the God of the Old Testament is not like the God of love that we know. But this is ultimately a story of God’s love for his people. This is the last of the plagues of Egypt, the death of the firstborn. Pharaoh has been warned again and again that God wants the Israelites to have time off from their slave labour to worship him. Each time the plagues get worse but each time Pharaoh says no. So the ultimate judgement of God is the death of the firstborn. It did not have to go this far, Pharaoh could have let them go earlier, or when told what the plagues would be could have relented. So the death of the firstborn, from Pharaoh’s own son to the first born of the lowest slave to the first born of all livestock. Except for the Israelites. 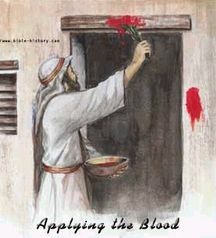 They were under the protection of the blood of the lamb, painted on the doors of their houses. When the angel of death saw the blood of the lamb he would would not enter these houses but pass over them. The life of a lamb was given so that many might live. The lamb dies. The Israelites are set free. This is Holy week, when we remember the last week of Jesus life which ends with the crucifixion of Christ on Good Friday. Jesus, the God/Man, takes the place for us of the Passover lamb. The life of one is given so that many might live. God dies. We are set free. A Rabbi and a Priest were asked to sum up their religion in one sentence. The Rabbi said, “They tries to kill us, God saved us, let’s eat.” The Christian version of that is, “They killed Jesus, God raised him up, let’s eat.